Cody in the summer is quite simply a glorious place to be. No wonder that the sleepy little town turns into quite the bustling metropolis during the warmer months. Stores are open late, restaurants and bars fix up their patios for business, the streets are thronged with window shoppers or bargain hunters, and the parks are filled with picnickers. The downside to all this renewal and energy is that hotels tend to increase their prices and fill up pretty fast. Therefore, if you know that you are planning a summer trip to Cody, make sure that you book ahead and keep your eyes open for bargains. Some of the nicest places to stay outside of town are the guest ranches that litter the area. There, you can relax in a more tranquil setting and also enjoy a more authentically western style of accommodation. The Bill Cody Ranch is one of the closest, being 26 miles west of Cody on the Yellowstone road. Guest ranches often offer horse riding and other recreational activities as part of package deals. In town, some cheaper options would be camping at the KOA or Ponderosa. The KOA features a great outdoor pool, while the Ponderosa has great facilities and even tepees to call home for a short while. There are also several other camping options in the area. Both Powell and Wapiti valley – about 20 miles away from Cody in different directions - offer some cheaper accommodations. In particular, the Yellowstone Valley Inn in Wapiti offers a scenic location, reasonable summer rates and an on-site bar and restaurant. If you just want to be in the center of things, there are several really nice hotels in town. In particular, The Cody and the Chamberlin Inn are luxurious and charming, the Irma has great history, a bar that travelled all the way from England and a resident ghost, and the Moose Creek Lodge and Suites has a great location and good rates. There are also some B&Bs to choose from if that is more your thing. For such a small town, there are some great dining options available. For that authentic western steak there is The Rib and Chop House, Cassie's or the Proud Cut. For those wishing to try some cuisine from other cultures there are two Italian restaurants, two Mexican restaurants on the main strip and a Japanese restaurant to choose from. The Terrace out by the Rodeo grounds provides great eclectic fare and the Irma has a wonderfully satisfying Sunday buffet menu. For that fun combination of dinner and a show there is also the Cody Cattle Company, which provides cowboy-styled entertainment with a western buffet. No visit to Cody would be complete without spending some time in the museum that has been dubbed “The Smithsonian of the West.” The BBHC houses five museums under one roof – Buffalo Bill and the history of the West, Natural history, Plains Indian, Guns and Western Art – so there is something for everyone. The museum also features many hands-on activities as well as programs specifically designed to entertain the younger guests. There is a pleasant eatery with patio tables in relaxing gardens where it is possible to bird and animal watch or simply hang out and soak up the sun. In June the BBHC also hosts the annual Native American Powwow which is a treat not to be missed. Summer is, of course, a great time to get outside and soak up the vistas. There are several hiking opportunities within Cody itself and the surrounding areas. The hikes can be as easy or extreme as you like. Within the city limits it is possible to take the whole family for a stroll around Beck Lake or along the Shoshone River. The imposing Heart Mountain makes for a more rigorous but seriously worthwhile day hike and there are several other scenic trails within the Wapiti Valley area or within Yellowstone itself. Another option is to explore the heights of the Beartooth Mountains from trails off the highway of the same name. 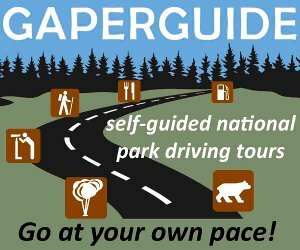 Pick up a hiking guide from the Cody Chamber. If viewing the sights from the comfort of your vehicle is more your thing, it is more than possible to plan some really spectacular road trips. The drive to Yellowstone along the north fork of the Shoshone river has been described as one of the most scenic drives in the US, while the elevated beauty of the Chief Joseph and the Beartooth highways have to rank amongst the most magical spots of the world. The drive east of Cody towards Greybull meanders straight through the McCullough Wild Horse Herd Management area and it is often possible to view the Mustangs from the main road or, if you have a four wheel drive, to veer of the highway onto Whistle Creek or McCullough road and get a little closer to their territory. No visit to the area would be complete without taking a trip to America's first designated National Park. Yellowstone is approximately 50 miles west of Cody up the winding North fork. The road itself is a glorious testament to western beauty and drivers will be treated to a view of the Buffalo Bill Reservoir as well as distant mountains, ancient rock structures and ice-blue rivers. For the speediest, most interesting and most enjoyable introduction to Cody, try taking a trolley tour. The Cody Trolley Company takes in 22 miles of history, sights and entertainment in just one hour and thus provides a spectacular overview of the area that will leave you plenty of free time to revisit any places of particular interest or explore the town on your own. Visit the Trolley Tours Website for more information. Old Trail town presents a snapshot of history with authentic historical cabins, Indian and Wild West artifacts and a graveyard for many western legends. It is open daily throughout the summer. A Wyoming trail ride should be high on your list for summer activities. The cowboy trail guides are used to beginners and experts alike and the horses themselves are kind and knowledgeable! Most of the guest ranches in the area offer trail rides – call around for different rates, packages and requirements. Some really fun packages include the breakfast ride where a cowboy will cook up tantalizing fare on a fire pit while you sit and take in the scenery. Most lodges have a weight and younger age limit for their rides although the Pahaska Tepee offers rope-led rides around the paddock for very young riders and the Cedar Mountain outfits in town do not seem to object to youthful riders either. The Cody main street is crowded with art galleries and unique stores which offer visitors the chance to take a piece of the west home with them. During the summer most of these businesses stay open pretty late so it is possible to spend the day sight-seeing and finish it up with a spot of retail therapy before or after dinner. There are few more authentically western experiences than the Rodeo. Every summer's evening at 8pm, Cody hosts the Nite Rodeo with events such as roping, barrel running and the fearsome art of bull-riding. This is a show that is popular with locals as well as tourists and it is a treat to see the rodeo stars up close and take part in the excitement that is so much a part of their daily lives. 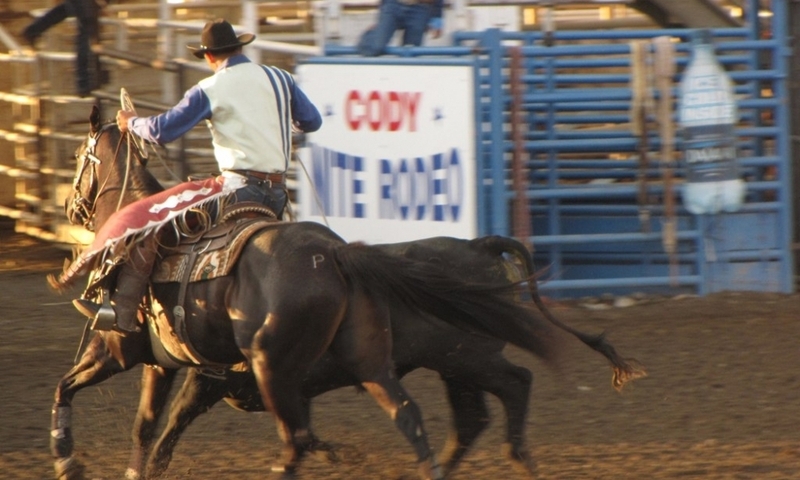 From July 1st to July 5th, Cody hosts the Stampede Rodeo. This is a professional event where the cowboys and cowgirls compete for the big bucks in events such as Xtreme bulls where the world's best bull riders fight it out for the grand prize of $50.000! If you like rodeos at all and you are in Cody for these dates, you should plan on this. On Friday nights throughout July and August, City Park in Cody hosts some fun summer concerts that are suitable for the whole family. Spectators tend to bring lawn chairs, blankets and picnics to relax and enjoy the fresh air music. There are also two Shakespeare in the Park productions hosted for free in the summer months – one in Canal Park, Cody and the other in Powell. Information is generally posted in the local paper. An entirely different family-friendly type of free entertainment is also provided during the summer months – a gun fight. This seasonal play takes place every night except Sundays outside the Irma hotel at 6pm. Early birds can steal a seat from one of the Irma's outside tables and enjoy a beverage whilst watching the show. Seats can be reserved for a minimal fee also, but many viewers choose to stand or perch on curbs or benches. Cody hosts a grand total of three parades courtesy of Independence Day. The first parade to take place is the Children's Parade which features both children and local children's organizations. The highlight for the children watching is the fact that those taking part delight in throwing candy to the crowd. This parade is generally a little quieter than the main act – the July 4th parade - which is held twice. This one packs out the sidewalks with lawn chairs and baby strollers and is full to the brim with small-town western charm.